In the course of my duties here, I've come across residential enclaves that appeal specifically to golfers, airplane owners, horse lovers and even to Latvians. But a development that's in the works near Las Vegas surely sets a new standard for "specialty marketing." To be precise, developers have received initial approval from planning officials for a gated community to be called Front Sight, which eventually will have 177 custom homes and 350 condominiums on 550 acres. What it will also have is more than a dozen shooting ranges. Piazza said the initial land development has begun on the parcel, which straddles two counties in the middle of the desert, about 10 miles from the nearest town, Pahrump. The residential portion of Front Sight will be on one side of the development, the shooting ranges (and the gunsmith facility, armory, gymnasium, rappelling wall, defensive-driving track and, oh, yes, the SWAT training tower and storm tunnels that double as a subterranean rescue training course) will be at the other. Plans for the various stages of the community include a landing strip as well as a community center, a private school for kindergarten through 12th grade, and retail stores. He says the residential portion of Front Sight should be open by the end of next year, but, initially, at least, you can't just buy a lot there: Front Sight is selling memberships, and those at the "platinum" level pay $240,000 in return for lifetime access to all the facilities and events, plus a one-acre lot that they can build a home on. Piazza told me earlier this month that he had 25 platinum members already, with one more likely to join soon. There are also varying degrees of memberships available, ranging downward to $7,200, he said. Piazza likens the concept to a high-end private golf club, except without the golf. He said the condominiums wouldn't be for individual ownership, but for visitors who want to spend a week or more at a time using the shooting facilities or taking classes, which tend to be heavy on handgun and riflery skills but include seminars on submachine guns. "We're taking the idea of a Pebble Beach kind of golf resort and applying it to the firearms-training industry and giving it a first-class, resort-quality facility," he explained. Unsurprisingly, he says he has gotten a lot of attention since he announced his plans a couple of months ago. "The response has been overwhelmingly supportive, but we've had a few people who don't understand it," he said, explaining that his development and company have no connections to any political or militia groups. "The people who are interested and are purchasing here are doctors, attorneys, accountants, successful business owners, and upstanding, law-abiding citizens who are very successful." Still, I'd count on the homeowners' association meetings being pretty lively. 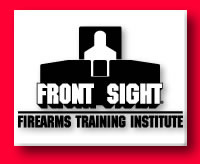 If you want to know more, Front Sight's toll-free number is 800-987-7719; Web site is http://www.frontsight.com/. Copyright 1998, The Tribune Company. Unauthorized reproduction prohibited.